Requests by governments for Google to take down videos, search results, blog posts and other content grew 68 percent in the first half of 2013 compared to the last half of 2012. That’s according to the latest release of the company’s recurring transparency report, which also includes information about things like copyright claims and user data requests. In 2013, governments and Google got a lot more attention for exchanging data than for removing content. Although the two categories aren’t entirely parallel, it’s interesting to compare. Google said last month it received 93 percent more user info requests from the government in the first half of 2013 compared to the last half of 2012. The transparency reports show Google seems to be more resistant to government takedowns than to government surveillance. While Google fully or partially complied with 65 percent of requests for user data, it complied fully or partially with only 36 percent of government requests (including courts, executive and police orders) to remove content. 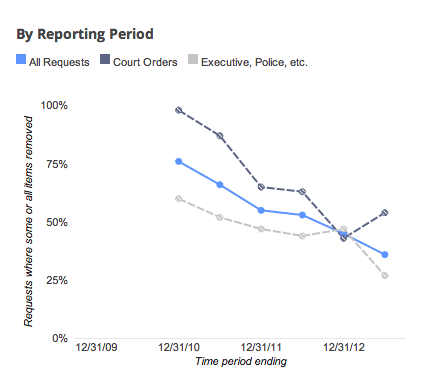 In fact, Google has become less compliant with government takedown requests over time; in the second half of 2010 it complied with 76 percent of requests. Again, every case is unique — and perhaps content removal requests really do tend to be more bogus, borne of hurt vanity rather than real issues — but there’s more of a pattern of compliance with user data requests. To Google’s credit, it is also fighting against aspects of disclosing user data in other arenas. Google and other tech companies are fighting to reform the laws and practices of government surveillance, through public statements and lawsuits over disclosure limitations.